Home » FAQ » How can I keep working with the mind maps I made in the Trial? Run SimpleMind Trial. From the main menu select “SimpleMind” →”SimpleMind Preferences” and select the tab “Local Mind Maps”. Start SimpleMind Pro (AppStore edition). From the main menu select “SimpleMind” → “SimpleMind Preferences” and select the tab “Local Mind Maps”. 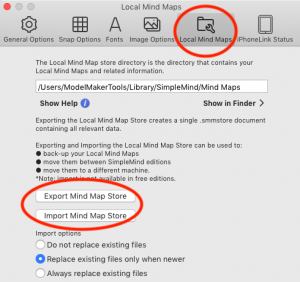 Click “Import Mind Map Store” and select and import the .smmstore file you just created with SimpleMind Trial. Check if all mind maps are imported into SimpleMind Pro (AppStore edition). Remove the trial afterwards. If the trial is expired, copy the mind maps manually. To do so, first unhide the Mac library. Start SimpleMind Pro. Click Main menu → SimpleMind → SimpleMind Preferences. This shows where the SimpleMind Pro stores its mind maps. Open this directory in Finder. Quit SimpleMind. Manually copy the files from the trial directory to this directory. Restart SimpleMind Pro to see your mind maps.